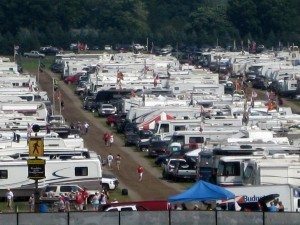 Many new RV owners will experience their first reality check shortly after leaving the RV dealer’s lot. For some, when you reach the foot of your driveway, it hits home that RV parking may not be as easy as you thought. Watching a person backing up a trailer for the first time can be funnier than a night out at the local comedy club — see-sawing back and forth, stop, pull ahead, back up again, you get the idea. 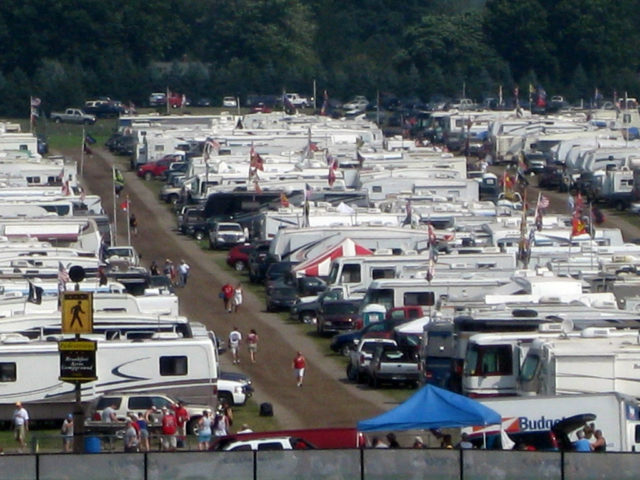 You need to get a handle on maneuvering in close quarters, because many RV parks pack ’em in pretty tight. Backing a long trailer is easier than backing a short trailer — because a short trailer tends to overreact quicker. #1 Stop right where you are, when you reach the point where you no longer have clear vision of where you want to go. Never attempt to move into tight quarters, if you can’t see all possible hazards. That is, unless you have someone positioned where they can see the obstructions and they can warn you. Your assistant must be positioned so they can see both you and the possible dangerous situation. #2 Avoid places that are impossible to get into, or nearly so. Don’t blindly pull into an unfamiliar driveway, dead end street, or parking lot that doesn’t have a second exit. When you pull into shopping areas, stay out near the perimeter and chose your parking spot so that you can simply pull ahead to leave. Don’t go down the aisles of parked cars — because you’re likely to be making a sharp corner in a confined spot, when you get to the end of the aisle. #3 Learn to rely on your mirrors. An RV isn’t like the family sedan. Looking over your right shoulder and down through the center of your motorhome or tow vehicle to back up won’t work. You have to rely on the image in your side mirrors. Straight vehicles, without trailers, are pretty easy to back up — because a properly adjusted mirror should give you a view of the side all the way back to the rear bumper. As long as you can see daylight between your RV and the obstruction, you’re good. #4 Set up temporary parking & driving patterns, using safety cones or milk jugs. Head out to a closed supermarket parking lot and set up your cones like a driveway or camping spot. Practice backing into those spots until you can do it without hitting any cones. #5 Practice blind side parking. If your luck is like mine, more often than not you’ll end up backing into a campsite from the blind side with your trailer. The blind side is the right (passenger) side of your vehicle. It’s known as the blind side because at some point, as you’re turning, your tow vehicle will no longer be in a straight line with your trailer. You will no longer be able to see what’s happening on at least one side of your RV. This is where an outside helper is essential to keep you posted on your progress. A trick I’ve used to increase my range of vision when backing around corners is to readjust my side mirrors at a different angle as I start making my turn. Most motorhomes, and many trucks, have electrically adjustable mirrors that you can control with a switch from the driver’s seat. 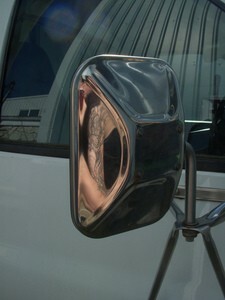 Adjusting the mirrors, as you proceed through the corner, will give you a clear view most of the way. #6 Never rely on rear vision cameras, because they’re pointed down toward the ground behind you and don’t give you a broad enough picture. There are overhead obstacles to be concerned about too. Low-hanging branches, building overhangs, even sagging power lines can hook your RV. By far the best way to back into a tight spot is to have a person (or even 2) outside watching all the angles. Maneuver with your windows down, and instruct your helper to talk loud enough so you can clearly hear them. 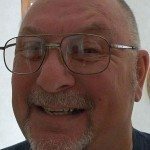 A set of inexpensive walkie talkies can be very handy for just this purpose. #7 Use extreme caution when backing a motorhome with a tow vehicle attached. In fact, backing up with a toad (car) on a tow bar more than a foot or so is impossible. Since the steering axle of the car being towed is free to track wherever it wants, as soon as you start backwards it will immediately turn the wheels causing extreme pressure to be applied to the front end components of your vehicle in tow. Damage can occur, because you will be skidding the car sideways, with the front wheels turned all the way to the stops. If you need to back up when towing a car, just unhook the car first. After you’re situated where you can go forward again, re-hook the tow bar. It’s the only safe way to do it.